Simon Thompson welcomed this release as an introduction to C.P.E. Bach’s symphonies, and it is indeed more of a mixed bag when compared to that from the Ostrobothnian Chamber Orchestra conducted by Sakari Oramo on the Alba label (review) which deals with the Wq 182 works in an orderly fashion. This is a live recording, and has plenty of that verve and energy you would want from such an experience. Audience noise is as good as absent and the recording quality is excellent, with rich bass, striking dynamic detail and plenty of stereo width. The blurb for this release would have us believe C.P.E. Bach is “an almost unknown figure … [a] forgotten pioneer.” I think this takes things a bit too far, but I do agree that these amazing orchestral works deserve to be better known. Just those stark repeated notes in the opening Allegro di molto of Wq 183/1 are enough to make you sit up and pay attention. As the music is thrown around the orchestra, changing direction like a switchback and delivering utmost excitement you begin to wonder where this music has been all your life. The sparsity of notes and extremes of register – bass and flutes in duet – are another feature in the Largo which follows. Then again there are those strange little vanishing melodies which interrupt the horn-pepped final Presto and those accompaniment arpeggios which leap out and take on a bizarre melodic function. These are all highly surprising elements, and each of these symphonies has their own shockers to entertain us from start to finish. Of the alternative recordings of C.P.E. Bach symphonies around it is worth looking out for the Academy of Ancient Music on the L’Oiseau Lyre or the English Concert with Trevor Pinnock on Archiv. Hartmut Haenchen on the Capriccio or Phoenix Edition labels is nice but more relaxed and less exciting than Rebecca Miller. Solamente Naturali on Brilliant Classics is dryly recorded and a bit ragged around the edges, so less of a contender. Comparing Wq 182/4 with the Ostrobothian Chamber Orchestra on Alba mentioned in paragraph one and there isn’t much to choose between the performances. Sakari Oramo injects more speed and perhaps more energy into the outer movements but pays the price here in there in terms of clarity. There are others with varying degrees of overlap, but by any standard these performances from the OAE are the equal of many and superior to most, and worth having in any collection. This is the kind of CD to put on loud in your car with your windows down. Heads will turn. ‘Not all orchestras are the same’ is the OAE’s catchphrase, and their releases are certainly worth looking out for. I like their Vivaldi Four Seasons despite the short playing time, and this C.P.E. Bach release is a real winner. C.P.E. Bach, known to the family as Emanuel, was often dismissed as merely the son of a great composer, or even as a transitional figure, one who strides between the high baroque of his father and the classicism of the likes of Haydn. Thankfully this view has come to be challenged with Emanuel being seen as important in his own right. The year 2014 saw the celebration of the tercentenary of the birth of J.S. Bach’s arguably most gifted and talented son. This present disc offers the listener the chance to relive a concert given early in the festivities. I wish I had been there. There has also been a rash of recordings and reissues to mark the occasion, but not too many new recordings of the symphonies. These are fine versions of four of the most popular of Emanuel’s symphonies as well as of the lesser known Symphony in E flat Major flat WQ. 179 but what are you looking for from this recording? If you seek an introduction to the music of C.P.E. Bach, or a single disc representation of his symphonic music, well, this is very worthy and rewarding - a recording that would suit that purpose well. However, if you want a CD that offers you more than an introduction — say you wanted to go on to listen to either the WQ 182 or WQ 183 collections of symphonies — then I would have to say that it is best to look elsewhere. There are some fine recordings out there, not least the OAE’s earlier disc (Virgin Veritas - either VC 7 90806-2 or 259 808-231) of the four Symphonies WQ 183 with Gustav Leonhardt. Sadly the Leonhardt disc is now only available as a digital download. All of that said, I rather prefer this newer disc as the performers seem to have a greater sense of enjoyment in the music than under Leonhardt. The recording wins out with the inclusion of the Symphony in E flat Major flat WQ. 179. There are few recordings of that work around. It even fails to make it into the 6 CD ‘Collectors Edition’ of the symphonies and concertos (DG Archiv Produktion 479 2499) and the Signum performance of this fine work is a gem. The excellent booklet notes by Lindsay Kemp add to the enjoyment, whilst the recording engineers have captured this concert very well indeed. Yes, the sound might not be as crisp and clear as a studio recording but slight reverberation can be forgiven when the performances are as good as these. 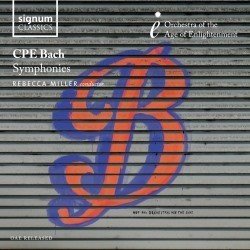 This is a most enjoyable disc, one which gives the listener a good introduction to the symphonies of C.P.E. Bach.